I love mushrooms. Mr always makes a joke about how I add mushrooms to pretty much every meal I cook, but why wouldn’t I? Mushrooms are amazing, tasty, versatile and so easy to cook with. 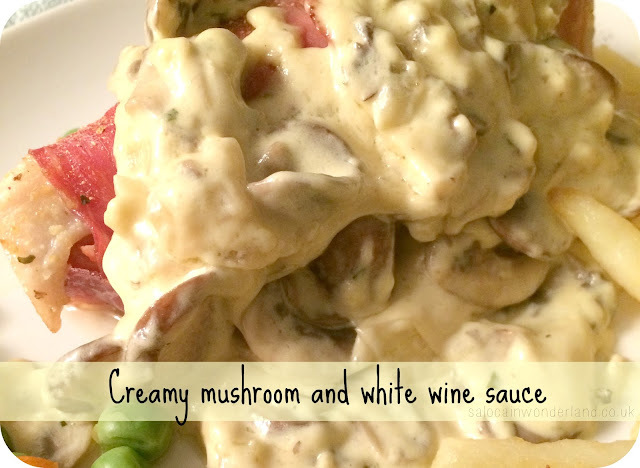 A creamy mushroom and white wine sauce is the perfect accompaniment to chicken dishes and I’ve been trying to nail a really thick and creamy sauce for a while now. I think I’ve finally hit the nail on the head with this one so, without further ado, drool bibs at the ready, here’s my thick and creamy mushroom with white wine sauce. Roughly 200g mixed chopped mushrooms. I prefer Chestnut and regular white mushrooms. Chop up your mushrooms, 1/2 an onion and finely chop the garlic clove. To a pan, add a tablespoon of olive oil. On a medium to high heat, let the pan warm up then add all the chopped ingredients. Cook until the mushrooms are soft and the onion has gone soft and somewhat translucent. Add the chicken stock cube to the 1/2 cup boiling water, stir and add to the pan, along with 1/4 cup of dry white wine. Bring to the boil then let it simmer for 5 minutes. Add 2/3 cup of double cream, stirring for 10 minutes, or, until the sauce becomes thick and can be manipulated around the pan. (e.g. if you push it back with a spoon it doesn’t come flowing back). Pour over chicken and feast! I love serving this sauce with chicken baked in prosciutto ham, sweet potato fries and a huge helping of veggies. So many people I know don't like them and I've never understood why, they're so good! It's the same with eggs, more people dislike them than like them and I think they're awesome! Hope you enjoy the sauce if you try it! I love mushrooms too! And they're low in calories so double woo! I was going to buy some today to make some form of stirfry stuff but remembered I have other stuff that needs eating. Doom.